To raise money for Save the Children, our branches celebrated Christmas Jumper Day by swapping their suits for sweaters. From snowmen and reindeer jumpers to an inflatable elf and Santa costume our branches spread festive cheer today across the country. 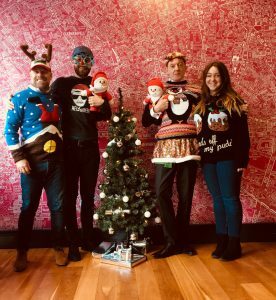 Last year’s star of the show, Mazel Tov the dog, made another appearance in the Weybridge branch's Christmas snap, but one of our favourite pictures taken from this year comes from the team on Southampton Row. With an added touch of sparkle, reindeer antlers and a Christmas jumper portraying old Saint Nick stuck down a chimney: you couldn't get much more festive! For those unaware of the power of the pullover, your support can protect children from easily preventable yet still deadly diseases. So far the charity has raised more than £84,000. There is no deadline to donate, but the sooner you make a donation the sooner your money can start making a difference. Visit www.christmasjumperday.org for details on how to get involved.